Panathinaikos are a Greek football team based in the city of Athens. Arguably their greatest achievement, continentally, to date came in 1971 when they reached the European Cup final where they lost to Ajax 2-0. They have yet to suffer relegated from the Greek Super League. 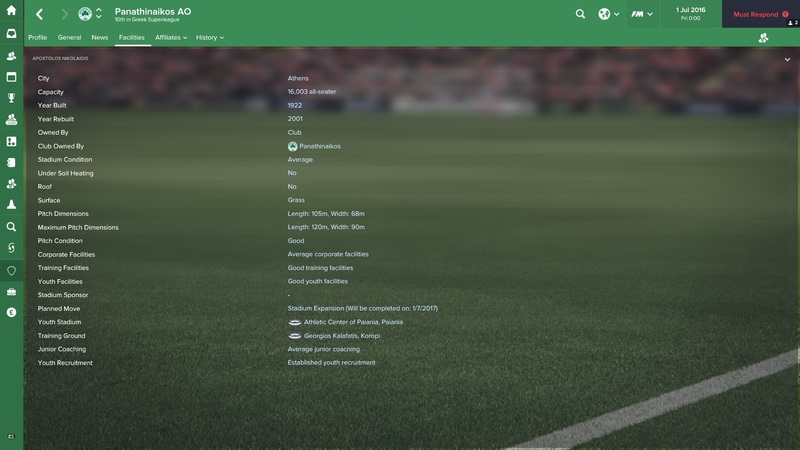 In Football Manager Panathinaikos could become the dominant force in Greek football under the right leadership. You will have to defeat rivals Olympiakos, who have won 19 of the last 21 league titles. But, with patience and perseverance, you could topple the Greek champions within a few years. Swedish international Marcus Berg has been at Panathinaikos since 2013 and has scored 43 goals in just 70 league appearances. Use him well, he is 29 and perhaps just past his peak but he could still be a key player for you in the first couple of years. Rodrigo Moledo is a strong Brazilian centre-back who can be your rock at the back. Like Berg, he is ageing and past his peak, but at 28 you could still get three good years out of him before looking for a replacement. The third key player we will look at is Portuguese Zeca, a tireless midfielder with great defensive attributes. As a ball-winning midfielder he could easily be deployed in centre midfield or defensive midfield and will allow your more creative players to venture forward more freely. Attacking midfielder Giannis Bouzoukis, 18, will need tutoring to be able to reach, or exceed, his potential. But under the right tutelage he could become an important squad member for your side moving forward. Panathinaikos seemed blessed with strong central players (perhaps you might consider a narrow formation moving forward) and Paschalis Staikos is no different. 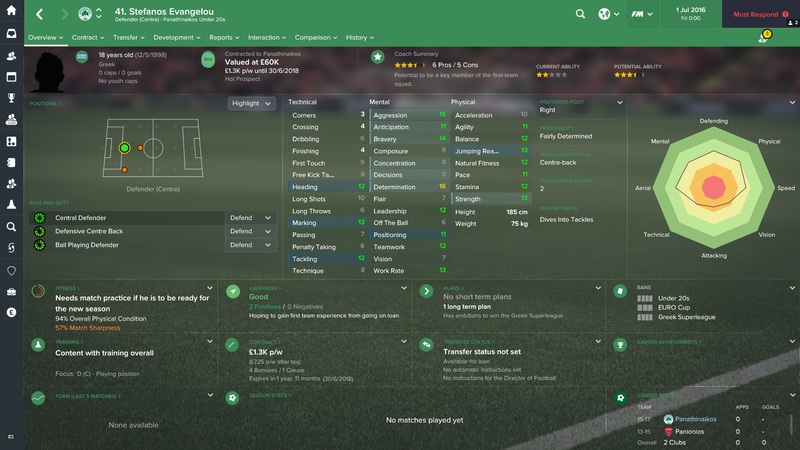 At 20 years old he has less time to grow, but with first team football he could still reach his potential. Stefanos Evangelou is a determined centre-back with very good mentals for someone his age. Of the three hot prospects Stefanos looks to have the greater future ahead of him. Develop him well and he could be the future of your Greek side. You will need to look to push for Champions League qualification in order to help secure your finances as you progress in the save. 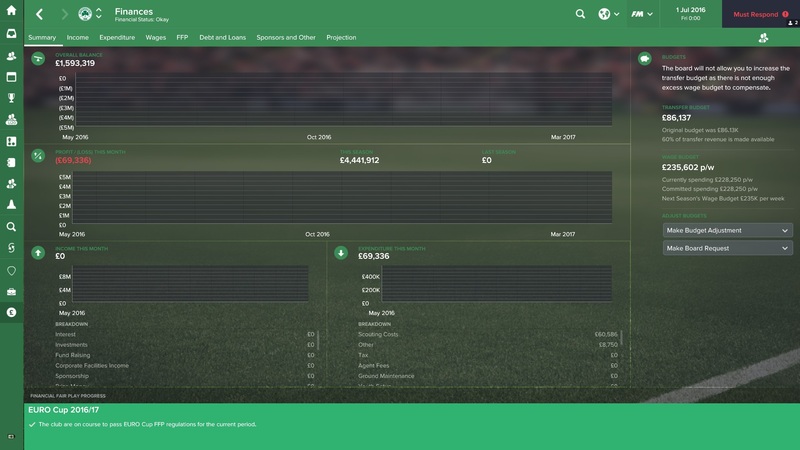 With little transfer budget you will have to make do with free transfers and loan signings in year one. It is clear to see that you have one big rivalry to focus on. Olympiakos have dominated the Greek league since the mid-nineties. Panathinaikos have been second-best for far too long and will need to become Greece’s best side once again. Are you the right person to make it happen? Thank you for reading our club guide to Panathinaikos. I hope it may have inspired you to begin a save with the Greek Superleague club. This entry was posted in FM Guides, FM17 Guides, Experiments & Wonderkids, Football Manager 2017 and tagged europe, FM Guides, fm17, football manager, giannis bouzoukis, greece, marcus berg, panathinaikos, paschalis staikos, rodrigo moledo, stafanos evangelou, zeca. Bookmark the permalink.